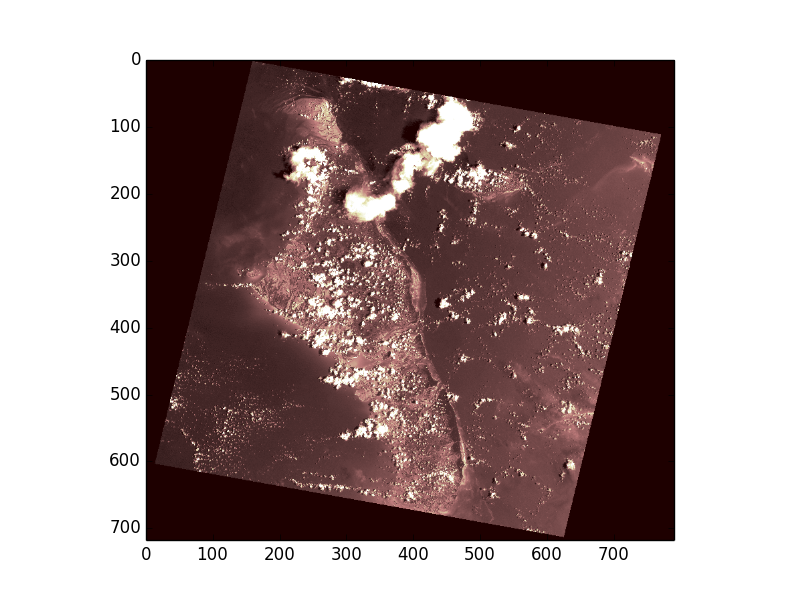 Dataset objects provide read, read-write, and write access to raster data files and are obtained by calling rasterio.open(). That function mimics Python’s built-in open() and the dataset objects it returns mimic Python file objects. If you try to access a nonexistent path, rasterio.open() does the same thing as open(), raising an exception immediately. The returned object is a 2-dimensional Numpy ndarray. The representation of that array at the Python prompt is a summary; the GeoTIFF file that Rasterio uses for testing has 0 values in the corners, but has nonzero values elsewhere. Instead of reading single bands, all bands of the input dataset can be read into a 3-dimensonal ndarray. Note that the interpretation of the 3 axes is (bands, rows, columns). See Image processing software for more details on how to convert to the ordering expected by some software. In order to read smaller chunks of the dataset, refer to Windowed reading and writing. The indexes, Numpy data types, and nodata values of all a dataset’s bands can be had from its indexes, dtypes, and nodatavals attributes. To close a dataset, call its close() method. After it’s closed, data can no longer be read. This is the same behavior as Python’s file. As Python file objects can, Rasterio datasets can manage the entry into and exit from runtime contexts created using a with statement. This ensures that files are closed no matter what exceptions may be raised within the the block. Format-specific dataset reading options may be passed as keyword arguments. For example, to turn off all types of GeoTIFF georeference except that within the TIFF file’s keys and tags, pass GEOREF_SOURCES=’INTERNAL’ . ...     # .aux.xml, .tab, .tfw sidecar files will be ignored.